Boy are we excited to see these pictures!! 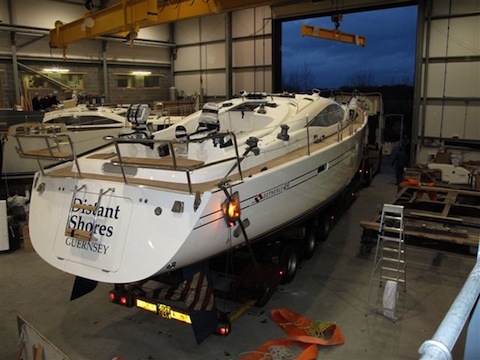 Our new Southerly 49 is finished and heading off to the London Boat Show. Northshore are bringing five boats to the show this year and they all travel in a convoy from the South of England the 3 hours or so up to London. Note the running lights strapped to the side of the stern! Because of the lifting keel the boat isn’t really very tall on a truck. On the stern you can see she has a large opening garage door. This is a first for us and we are interested in seeing how we get on with it. 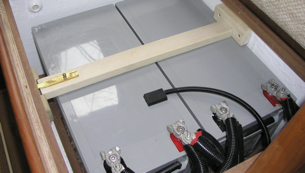 The door opens hydraulically by remote and offers lots of stowage aft for dive gear, dinghy stuff etc. When folded down it is a boarding platform. There are also a few shots showing the inside finished. We chose Cherry wood for the interior again (same as on the 42). This is the forward master stateroom (looking forward). The black circle under the bunk is a heating vent! For the first time in 20 years of voyaging we are planning a trip north! Details to follow! If you are around England early January why not come to the London Boat Show! And if you do please drop by Northshore’s booth (stand) and say hello!! 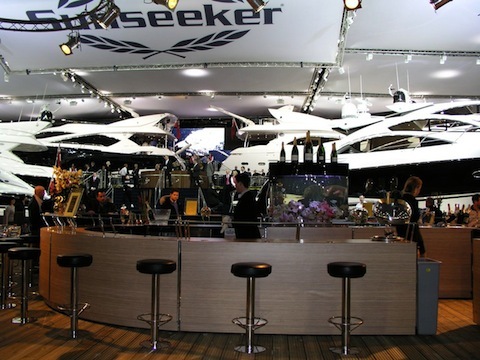 Its just a couple of weeks until the London Boat Show. Northshore is taking our new boat to the show so it must be ready on time! 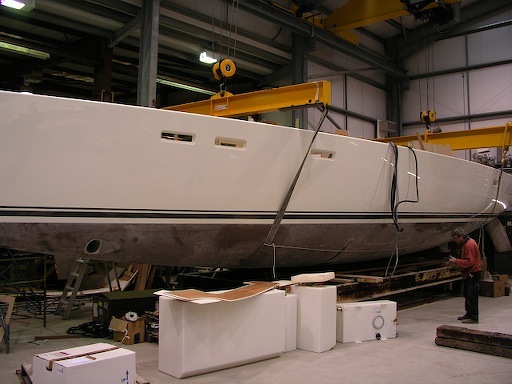 Here she is in the factory as final touches are applied on deck. Note how low the boat sits in the factory since here keel is fully retracted. 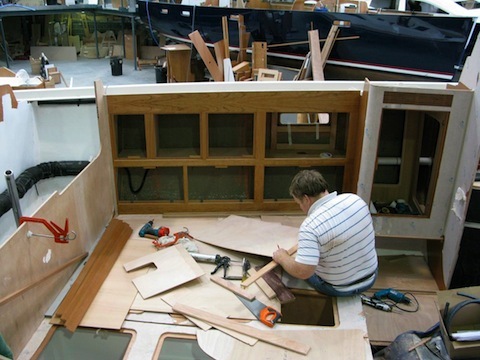 The London Boat Show starts on January 8, but it turns out the boats must arrive well before that for the set up in the buildings. So she will be moving from Northshore around December 20! I was quite surprised it is such a long set up time. The London Boat Show is the only boat show I have been to outside North America, and its AMAZING! We were there three years ago and I have to recommend it if you can get there. 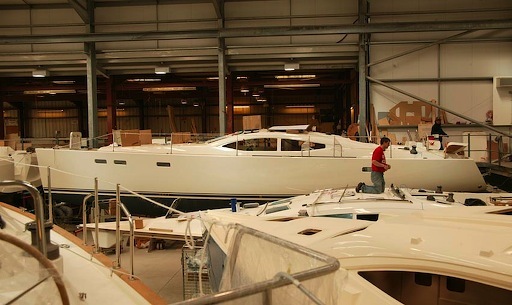 Certainly if you are serious about getting a new cruising boat, it pays to check out the European offerings, and many more of them come to London than the American shows. Plus its just plain fun to go to a different boat show! We found London was amazing in how much work was put into the displays, or “Stands” as the British call them. 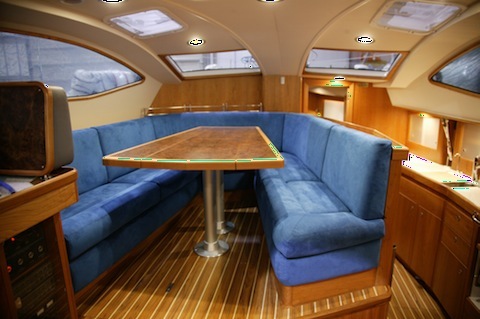 We are used to some carpet being put down around the boats, with ramps and stairs to help you get on board. But in London the Stand can be much more ornate. This year Sheryl and I are very excited to be presenting on the main show stage at the London Boat Show! 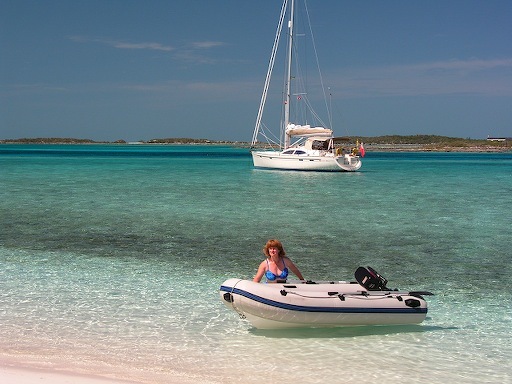 We will be talking about our latest transatlantic crossing in 2007, and give some hints for enjoying the amazing shallow Bahamas. If you are around please drop by! Of course we will also be hanging around our new boat at Northshore’s stand. We will be at the show Friday Jan 8 through Monday Jan 11 then flying back for Toronto. The last few weeks we have been cruising the Chesapeake Bay and run into a bunch of cruising sailors. Many of them are on their way south for the first time. 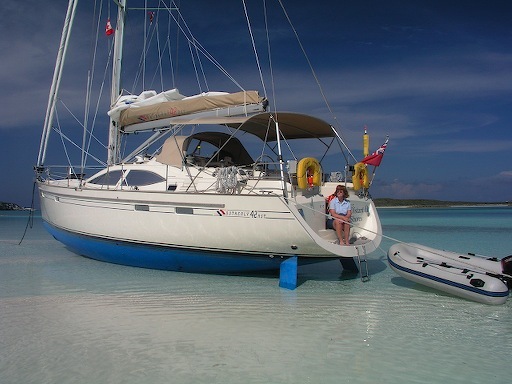 Besides a bit of nervousness and excitement about the voyage ahead (most are heading for the Bahamas this winter) a common theme is boat maintenance. Living and traveling full-time means things tend to break more often and delays often result. We met one “great-looper” who had spent 2 unplanned years in the Chesapeake Bay while his generator and main ships engine were replaced!! Here are a few strategies we have picked up or developed over 20 years of cruising to keep maintenance-related delays to a minimum. Plan to be handy - All boats will need maintenance. Old or new power or sail. Upgrade your skills in areas you are weak in. If you don’t understand electrical systems, take a course or study one of the many excellent books. Buy some good tools. 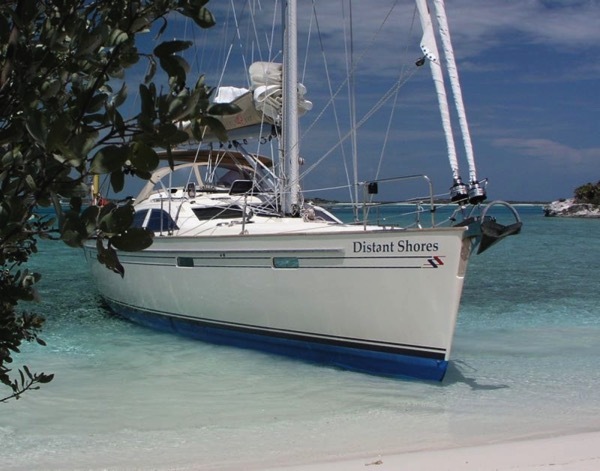 If you normally depend on a friendly local mechanic to service your boat you might find it is not so easy to find reliable help as you travel. Keep ahead of scheduled maintenance. At least when you’re getting to know a new boat it makes sense to do maintenance on a recommended schedule. For example, buy a rebuild kit for the head (toilet) and install it. You will feel more comfortable knowing you have done it and you may learn if there are any additional spares to keep in stock. With our Jabsco head I also keep sets of the joker valves in addition to a complete rebuild kit. Build up a spares kit. This is the heart of the deal for reducing maintenance delays. If you have the parts you need before you need them, and know how to put them in, you could be looking at a 10 minute delay instead of a 4 day delay while you wait for parts. We have a whole locker full of parts on Distant Shores and a separate bin just with engine parts. Keep adding to the spares kit. Experienced owners can be a good source of info. 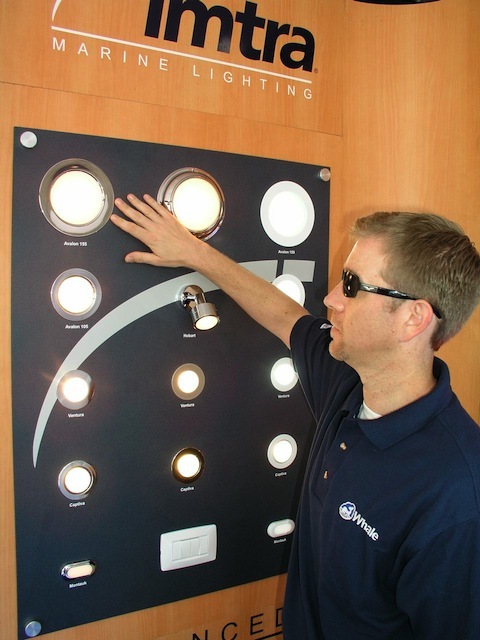 Those who have had the same equipment as you have on your boat will know what spares they have needed. Keep adding to your tool kit. A good basic tool kit can do most things, but there is often no substitute for the right tool. The job can be oh so quick and satisfying if you have the right tool in your toolkit when you need it. An example is the propellor puller I built some years ago. I also built a cutlass bearing puller so if we were in the boatyard I could easily pull the prop, shaft and cutlass bearing out in less than an hour. Now we have the new boat I am again adding to the toolkit for her new systems. An example is the nice little impeller puller I recently bought. The raw water impeller on the Yanmar now comes off so nice and easily. (the old Volvo impeller came off easily anyway so I didn’t need a puller). 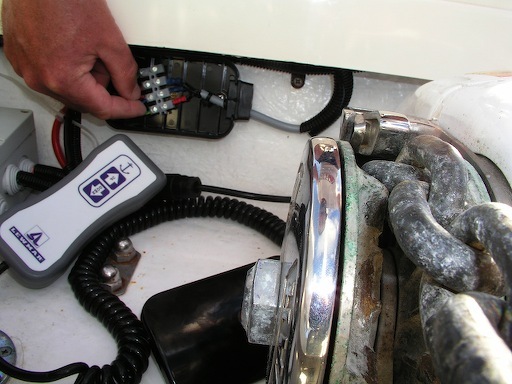 Get familiar with your boat’s systems. Over the years I have serviced the Barient winches on Two-Step many times. I knew just how they worked and just where the pawls tended to stick after time. Now with Distant Shores we have Lewmar winches. So before they were really meant to be serviced I got out the manual and opened one up to see how it worked and how it differed from the Barients. When it was time to service them I knew what I would find. Older boats can need much more maintenance as systems age. But new boats will need regular preventative maintenance as well. Read over the owners manuals of the various systems and see what is recommended. Even if a winch is working fine - why not take it apart and see how it looks inside. Order a set of spares for it before you need it. We often carry spare pumps as well as rebuild kits for the pump. It is often quicker to replace the pump and then rebuild the one you have taken out. Make maintenance fun! Sounds silly but if you can learn to enjoy boatwork then you are more likely to get to it early. 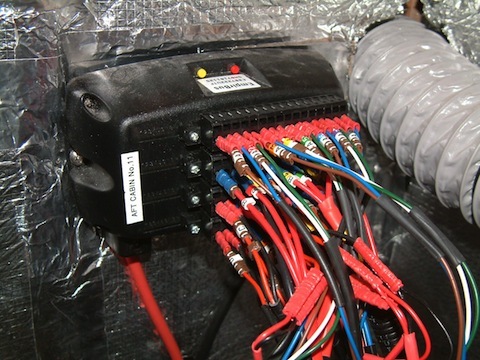 It is a very rewarding feeling to see YOU have maintained / improved / serviced the systems on your boat. The boat will work better, there will be less delays in your cruise and you will have that sense of pride that you did it yourself! 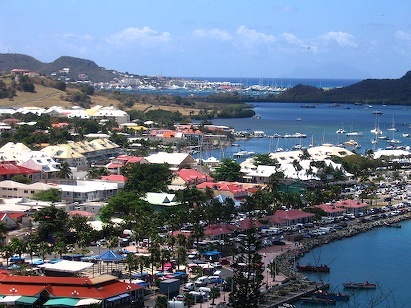 Well there you are... 10 basic hints to enjoy a trouble-free cruise. While we were over in England we naturally dropped in at the factory to see the new 49! It all looks to be progressing quite well. The build started in June and will not finish until the end of December - so this is roughly the halfway point. Many of the systems are going in now and you can see quite a lot of cabinetry. This shot shows the aft cabin looking at the port side. The stainless post sticking up at the far left is the port side rudder post. 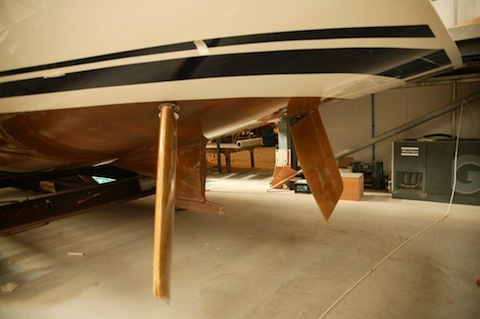 Its angled inward since the rudders have an outward slant to increase their effectiveness when the boat heels. Here is the forward cabin with the head door on the far left. In the upper right is the forward bulkhead. The 49 has a large forward storage locker ahead of this watertight bulkhead, then another bulkhead and finally the anchor locker at the bow. I think this is a great idea since it means double security in case of collisions. One of the great things about a raised saloon seating area from a weight and design point of view is that it means a lot of heavy things can be located in the large space underneath that raised section. 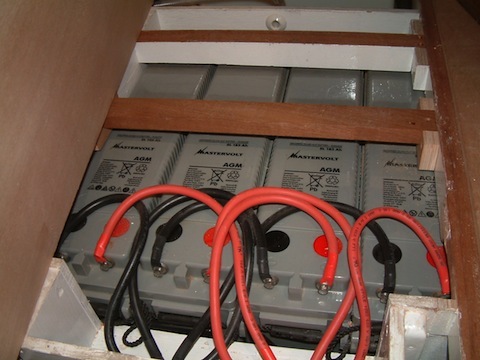 So Northshore has put the water, holding and fuel tanks, generator and batteries very near the center of the boat. Keeping weight central and low means the boat will perform better. The Boat Show is always a good place to get a first look at the new gear that has hit the market, and electronics is always changing quickly. 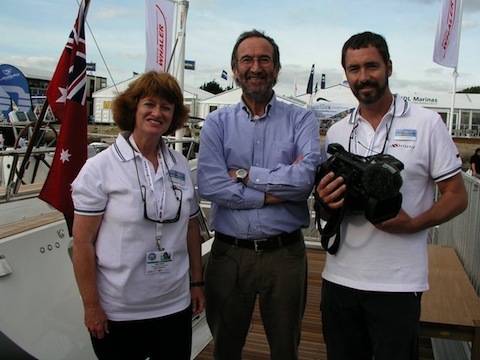 Two years ago when we were outfitting our Southerly 42 it seemed we had such an advanced system! But these last two years has seen a big advance in technology, especially with Radar and chartplotters. 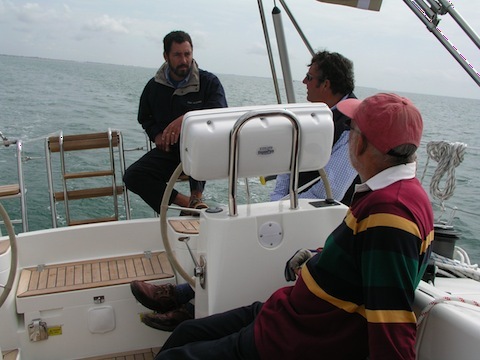 This year at Southampton I got a tour of the new Raymarine “Hybrid-Touch” chartplotters. I have always liked the idea of a touch screen for the obvious convenience, but been leery of using one on a boat with saltwater and spray around. The conductivity of saltwater drips or spray on the screen would make the touch screen think you were touching it. A great idea for an enclosed bridge of a large yacht but not practical for outdoor helm stations. 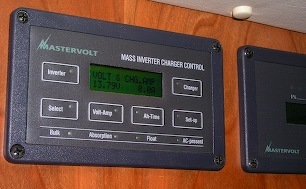 Raymarine has solved the problem with a very clever mix of the two technologies, hence the hybrid. It looks like the former “C” series plotters with buttons for all functions, BUT it also has a touch interface that can do the same functions. 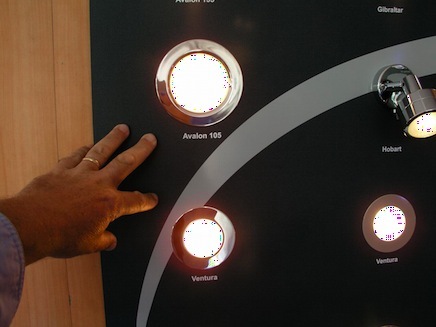 You can switch back and forth between the two seamlessly, press a button then touch the screen. Very neat! 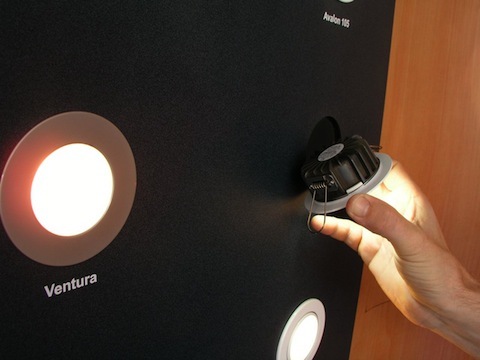 But for safety and usability in spray or rough conditions you can deactivate the touch screen. Check out the demo on their website! Radar is the other big breakthrough. In the last couple of years radar technology has advanced dramatically. “Digital” and “Hi-Definition” are not just marketing slogans. Advances in technology has allowed the brains of the radar to be moved up into the scanner itself, and for it to be much smarter about sending out and receiving the pulses radar uses to see the world. The new Digital radar means the whole radar function is done up in the scanner, then the final image is sent down by a thin ethernet cable instead of the thick bundle of signal cables of last year’s radars (those cables were as thick as a thumb!). We are very keen to get out on the water and try these new technologies! I will report back!! A highlight of the Southampton show for me was meeting Yacht Designer Rob Humphreys. 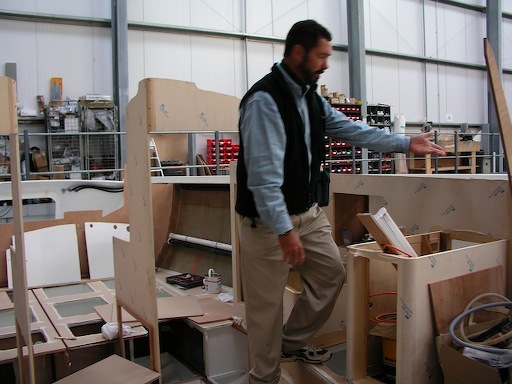 He has designed a great variety of boats over more than 35 years from racing sailboats to super-yachts. 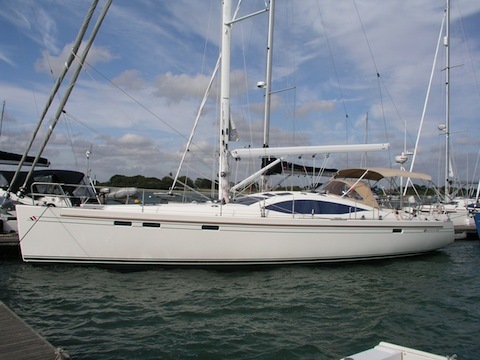 He has worked with Northshore for years improving upon the Southerly Swing Keel and he also designed the Southerly 42. Now he has designed the hull for the new 49. It was largely because I think his hulls are so good that I wanted to sign up for the new 49 even before I had a chance to sail the first one last month! We had a chance to chat and Rob had a number of comments about the 49, and Southerly’s in general. Rob’s first comment was one I had realized when we sailed our 42 offshore. “Southerly’s are not constrained by the normal design restriction of needing to have a shallow keel. Most keels are a compromise since cruising boats can’t draw too much, or else they would be limited in their harbours and anchorages”. Our 42 draws 9 feet!! This makes a very good upwind boat and a boat that is very stable at sea in big waves. 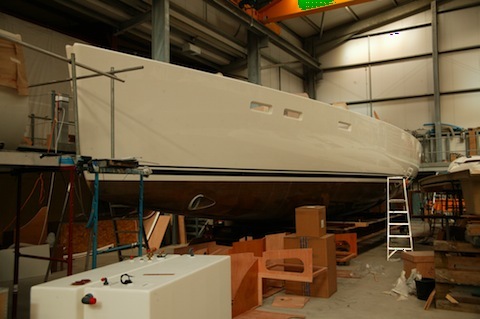 Basically since the keel will be raised in shallow waters, Rob is free to make a deeper keel than any normal cruising boat or cruiser/racer. We find that swinging the keel down all the way makes the boat roll far less than other boats we have sailed on. Southerly’s also have a very good motion at sea thanks to the high total ballast. 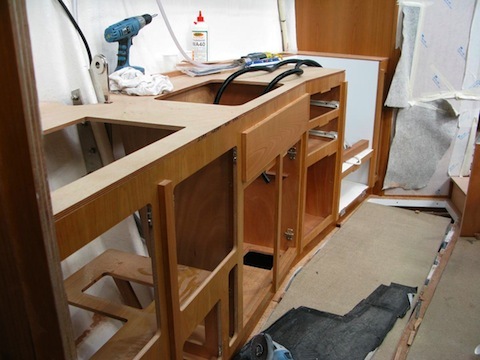 Since the keel will be swung up and down, the boat needs to have sufficient ballast even when the keel is up for safe passaging. This is accomplished by the heavy “grounding plate”, in combination with the keel weight. The combination makes for a smoother ride in rough seas, but the long waterline length makes her fast as well. Here’s the keel and grounding plate for the new 49. HUGE!! We also talked about the rudders. Having twin rudders means one will always be deeply buried, and since they are angled outward, the working rudder has a good angle as well. 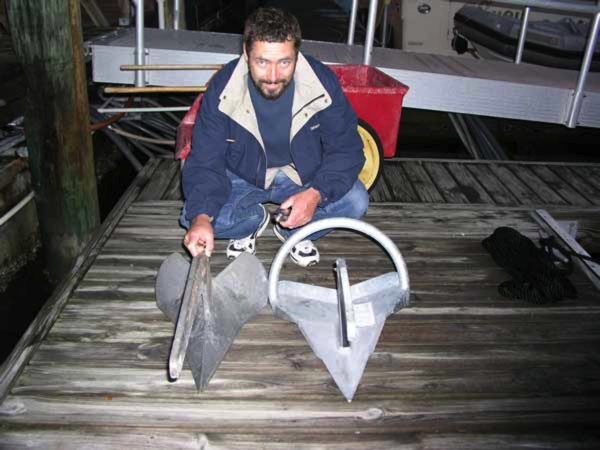 A second benefit is that when sailing downwind you have both rudders buried and extra stability. Finally we discussed swinging the keel up. Its another advantage to the Southerly in that you can raise the keel to any desired position. So sailing downwind in calm seas you can raise it entirely to reduce drag. Or sailing in bigger seas where you still want keel stability to reduce roll you can raise the keel partially. Not only is drag reduced, but you also move the centre of lateral resistance aft making the boat easy to balance downwind. We did this much of the time crossing the Atlantic with the 42. It was a privilege to meet Rob and now I am really looking forward to sailing the 49 in some more boisterous conditions to see what she can really do!! We’ve been busy in the studio since we got back from England 2 weeks ago. 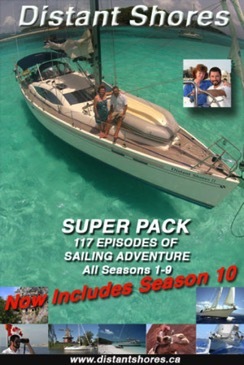 We have a lot of TV shows to get out after a fabulous year sailing. This is always a fun time since we get to relive our trip as we edit the shows! I have been working on the trip from New York down the Oswego and Erie Canals to the Hudson and then down the 140 miles to New York City. 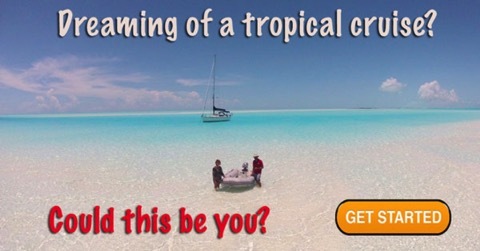 This is a very fun trip and is the start of “The Way South” for anyone in the Great Lakes who wants to make the journey to Florida, the Bahamas or the Caribbean. I do really enjoy editing the shows we shot since we get to relive the trip and hopefully provide useful information for viewers - who may be planning the trip themselves!! 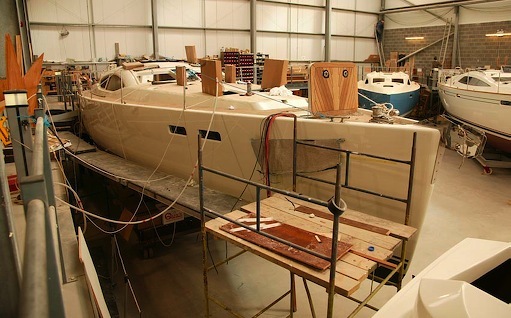 While in the studio - the folks at Northshore are kindly sending along updates of the new 49 - here are a couple of shots of her in the shop. As you can see she is out of the mould now. Northshore like to leave the boats in the mould at least a few weeks until the glass has cured completely and the bulkheads are in to make her absolutely solid. Not all builders take such care. The rudders are installed - not connected inside yet hence the unusual angle! 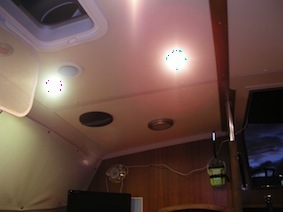 Most bulkheads are in already. Note the white coating over most of the inside of the hull. This is called a White Flo coat and is a special gelcoat that is meant to protect the inside of the hull and make it easier to clean. When we built Two-Step we had a lot of rough bits of fiberglass in the bilges that occasionally would catch a finger when you reached in or tried to clean up. It is a common problem with fiberglass boats - this should fix it. Whew what a whirlwind! After a great passage up from the Bahamas to Beaufort in just 3 days we made a quick run through the ICW to Norfolk and the Chesapeake Bay to Solomons Island. Our plan is to base out of there for the summer while we are back in the studio working on the new TV shows. We will be editing the first 6 episodes by the end of September. 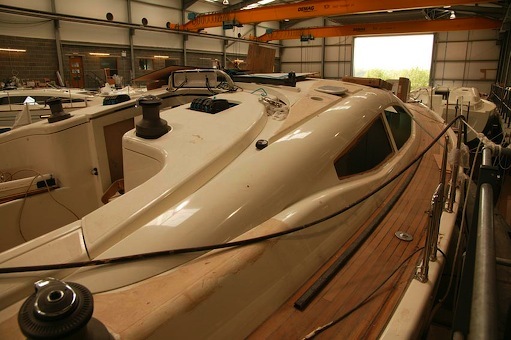 But before we got down to work we made a quick visit to the Northshore factory in England to see the first Southerly 49 - just launched and looking very racy down at the dock in Itchenor. Luckily the boat was free for us to take her out for a spin! First impressions are great! We only had light winds but wow does she go. We managed 6 knots in just 7-8 knots of breeze!!! We scooted right past ALL the other boats out that day. 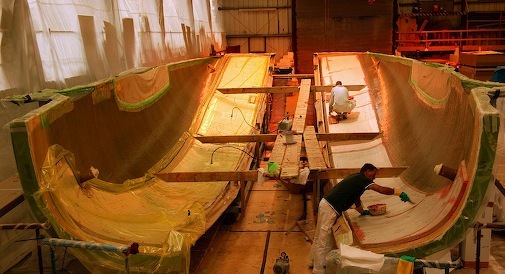 As usual the factory is humming - full to capacity with a waiting list for new boats. The “economic slowdown” doesn’t seem to have affected Southerly sales. I think the Southerly secret is the keel. They really are the only game in town for “variable draft cruising” with their lifting keel. They have perfected it after over 25 years of building these boats. And look at the keel. It isn’t a centerboard or any other kind of compromise keel. 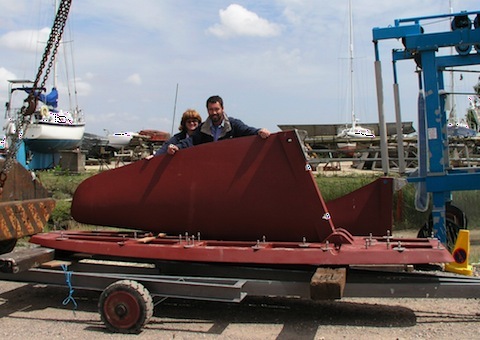 Here is the keel for our new 49. Beautiful. A true airfoil shape with over 10 foot draft!! Next after moulding the hull is to reinforce it with a stringer grid. This is made of foam and will be heavily laminated with fibreglass. The fibre is the real strength forming a box section. You can see how many stringers are there down under the waterline. 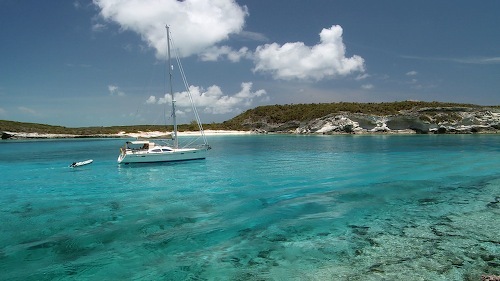 Here is a shot from a few days ago crossing from Exuma Islands to Eleuthera - 40 miles of water only 15 feet deep. I went overboard to get film of the boat passing near a coral head (which was about 30 meters diameter) you can see the outline of the keel plate set into the bottom of the boat. The keel is mostly retracted. We like to keep it this way if we are exploring in shallow water. 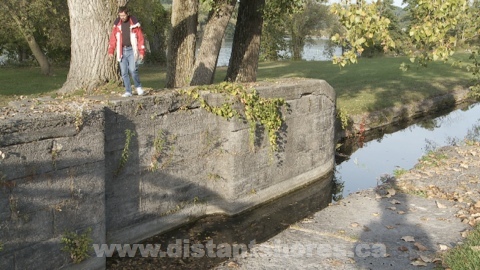 This way it acts as a safety in case we come into shallower water than we meant to. The keel will touch first and we slow down (since the keel weighs 3500 pounds it acts as a brake). 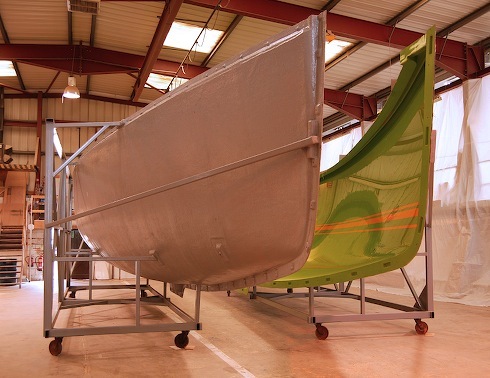 With the keel up and retracted the bottom of the boat is flat in the centre so you can beach and sit flat. 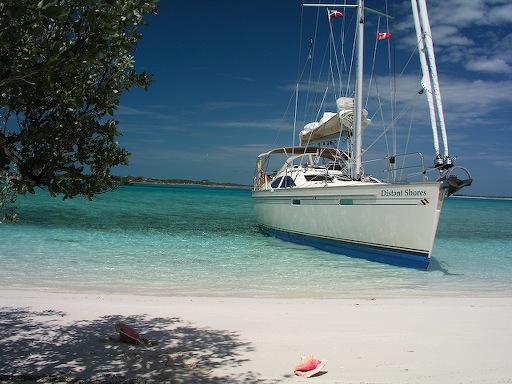 Here is a shot from a week ago in the Exumas where we beached Distant Shores on a sandbank. The boat is sitting safely on the keel plate and the prop skeg. Its low tide. There is roughly 3 feet of tide in the Bahamas. Hi from the Bahamas - just a quick note as we are filming today in Harbour Island Eleuthera. Note also that the upper part in the photo is greenish. This is actually the mould itself we are seeing with just a thin gelcoat applied. Northshore use a clear gelcoat as an osmosis shield as part of their Nordseal barrier system. So the area in green is below the waterline. More laminate applied as the process continues. 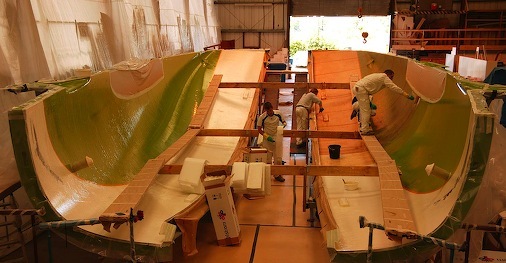 You can also see the core above the waterline being applied with vacuum bags (which is on the bottom of the picture as the hull pieces are on their sides. Now here are a couple of picture from the lovely Bahamas where we are currently filming on location for the Distant Shores TV series. Once again on this trip we are amazed that these islands aren't more visited. They are surely the best cruising area available to boaters on America's East Coast. The shallow water does scare some people off, but you can learn to handle it even with deeper draft boats (up to 6 feet draft is possible). But throughout the islands people are jealous of our less than 3 foot draft. Even the new 49 will draw less than 3 feet with the keel pulled up. 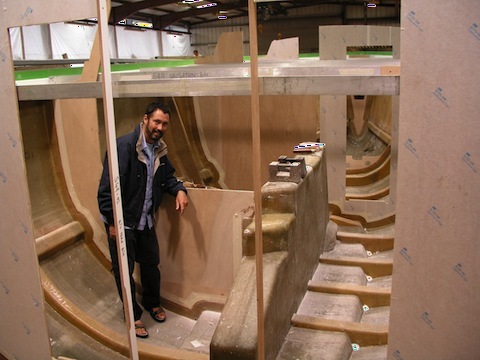 Here are a couple of shots of the mould of the new boat. To get a perfect finish the mould has to be meticulously checked over and carefully polished. Note the orange stripe lines. These are to show the layup crew where to put the waterline. 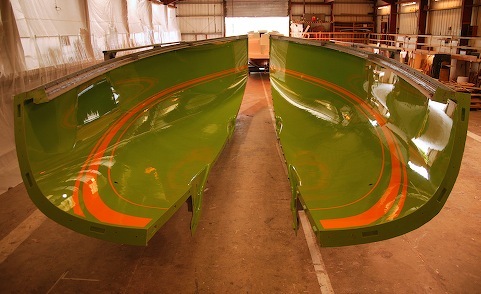 Coloured gelcoat is applied to the mould using the orange as a guide to become the waterline on the finished hull. Some manufacturers use tape for the bootstripe lines but Northshore use gelcoat since it will be much longer wearing. It is the area that needs a frequent scrubbing since it is right near the water. Observant viewers will note the caprail is moulded into the hull on this boat. (see the overhanging lip at the top of the mould. The deck sits on this and is joined there rather than being joined on the caprail. This means we have a solid glass caprail instead of a decorative teak one as on the 42. The join is covered by the teak decking. So the new boat has no decorative teak outside. We do have the lovely teak decks and teak cockpit floors/seats but no other teak. I do very much like the great footing of teak decks but don't like maintaining decorative teak (either with varnish Cetol or whatever). The teak cockpit floors/seats on our 42 have been great and only require a scrub every month or two. 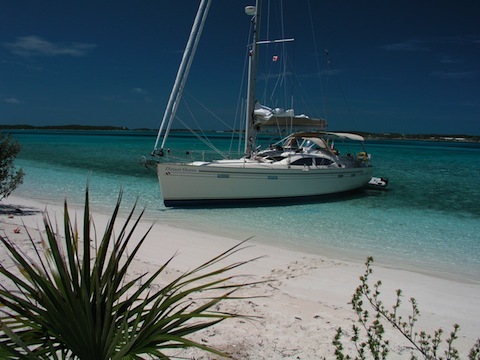 Now here's a picture to inspire .... as we are cruising the Bahamas and working on the 6th season of the Distant Shores TV series. This is a wonderful place if you have a shallow draft like the Southerly. (note the new boat still draws less then 3 feet despite being 6 feet longer!). We will be here for a few more weeks then jumping of to the Chesapeake Bay. We will be getting hull number 2 of this boat so of course we are looking closely at all the images to see exactly how things will be set up. 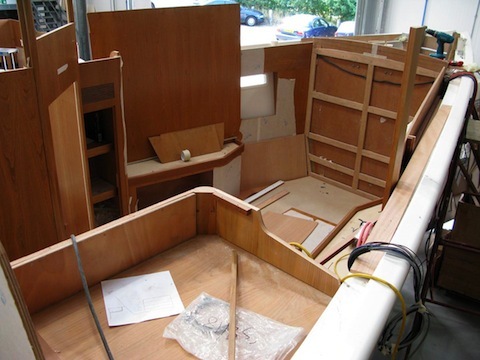 Although we have poured over the plans to get a good picture of the boat, photos will help even more. From the side you can see she is quite similar to the 42. Raised Saloon which we love! Aft cockpit. Long waterline. Looking at the dimensions shows a different emphasis in the design. 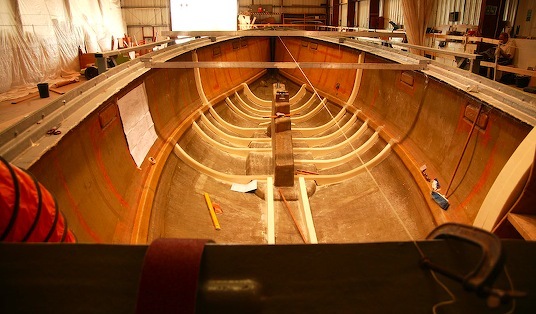 but raising the keel still has the draft less than 3 feet - just 2 foot 10 versus 2 foot nine. So basically the new boat is a sleeker version of the 42. 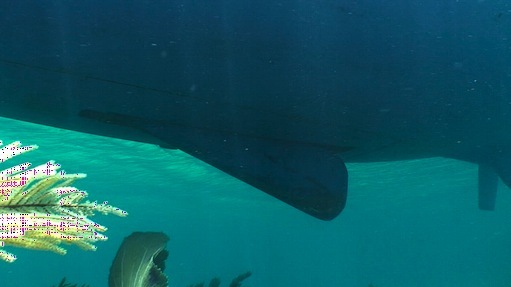 More than 6 feet longer and with a much deeper keel but only 6 inches wider. Note the teak side decks with the genoa track mounted on them. The 48 is designed with our favourite double headsail rig as a standard feature (it was an option on the 42). 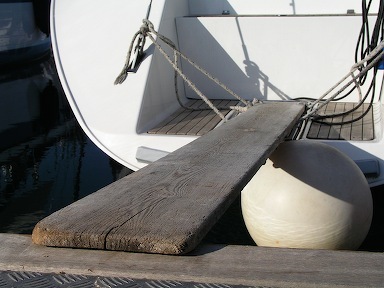 The decks are wider and the teak will be nice to give good footing when you go forward at sea. Well that's it for now, more updates soon! Hello from the French island of Guadeloupe. After the tiny islands we have been exploring this is a change with a big port and lots of people. The marina here is good place to get things done with chandleries and service people for almost anything. 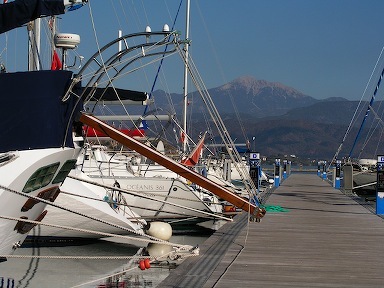 In fact the marina is quite full and we got put on the big boat dock where you drop your anchor and back up to the quay. We got the chance to put our Lewmar Auto-Anchor to the test and try our first stern to the quay mooring using the system. From our years spent in the Med we are quite comfortable mooring stern-to and I thought I would describe the procedure for those who haven't tried it before. Many marinas provide a straight dock without finger piers or pilings to tie the boat to. There are just cleats or bollards along the dock. Boats drop their main anchor away from the dock and back in, throwing stern lines ashore to secure the boat to the quay. The anchor will hold the boat away from the quay. Besides being cheaper to build marinas, the dock can accommodate any or width of boats this way. This system is quite common in the eastern Med. 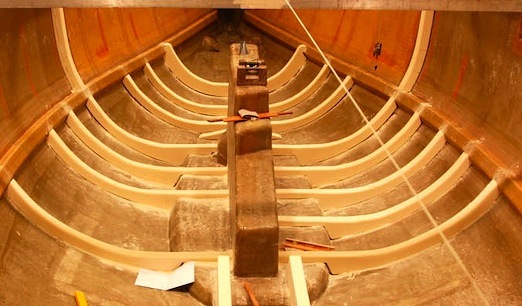 Step 2 – line the boat stern up so you point stern to the quay and drop the anchor. It depends on how your boat handles but if there is a crosswind I position the boat slightly upwind before dropping the anchor in the chosen spot. Now drop the anchor. Step 3 – Back up towards the quay dropping chain out as you go. Initially you will need to keep it slack but once some chain is out you can tug it gently to set the anchor. When you have enough scope out, you can set the anchor by giving it a stronger pull. This is why its better to have a bit more scope out so you can set the anchor and know its holding before you get all the way stern to the quay. HINT: Our old boat Two-Step was a long-keeled boat and was terrible to control in reverse. But Med-mooring was easy because we had the anchor out as an extra control. As we backed up the wind would blow the bow around but we could then put a little tension on the anchor chain and use this to straighten the bow out again. Sheryl stayed up at the bow and worked the old manual anchor windlass letting the chain out slowly until we got near enough to the dock to throw a line ashore. When we got turned she would stop the chain and the bow would pull around back into line. Step 4 – Come in between the boats on either side and tie up. We have all our fenders out with one reserved as a “roving” fender in case we jostle our new neighbours. Once you get in between the other boats you have done the hard part. Now toss a line ashore if there is someone waiting. If not then you can come in close and lassoo a piling. This is one time where having control of the windlass from the helm really pays off. As we backed up to the quay here in Guadaloupe I was able to see the amount of chain we had out, and let it out myself as we backed in. This left Sheryl free to manage the roving fender when we got close to the other boats. Step 5 – Tie up. With lines ashore now is the time to tighten up on the anchor chain to make sure your anchor is well set and will hold you off the dock. There can be quite a strain on this in a stiff crosswind so you need to be certain it isn't dragging. I use the engine in reverse to pull the boat in, tie the lines as tightly as we need to keep the boat in to the quay. 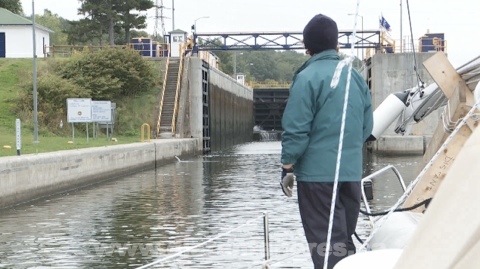 Tighten up on the anchor chain as needed and make sure you are not dragging. If it is slipping you might be able to set it by pulling or you may need to go out and try again!! Step 6 – Tidy up. I put an anchor snubber on to take the strain off the windlass. This is a chain hook on a length of line. I put it on the chain just off the bow, pull it tight on a cleat and then let tension off the windlass. Voila – anchored stern to the quay. know the length of your chain. Nothing is more embarrassing than backing in perfectly and finding you are still 6 meters away from the dock and you have reached the end of the chain!! Many boats that moor this way often have 80 or 100 meters of chain or more. try not to cross the next boat's anchor chain. If all the chains are lined up parallel then there will be no problems. But if you cross over their chain and they leave first, they will pull out your anchor. 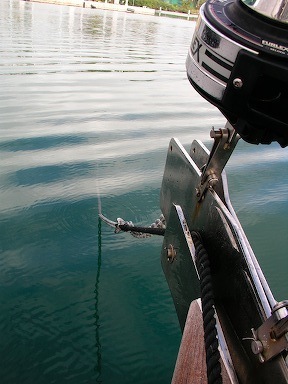 the chain counter and control at the helm is a great asset when Med Mooring. I have watched our Greek friend Thanos in Rhodes, bring a 50-footer in to the dock all alone and do a perfect stern-to mooring. 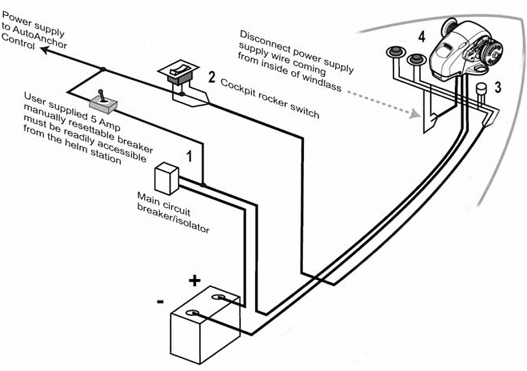 This is a very cool add-on for an electric windlass!! 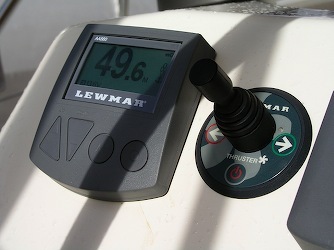 I have just finished the installation of an "Auto-Anchor" for our Lewmar H3 windlass. 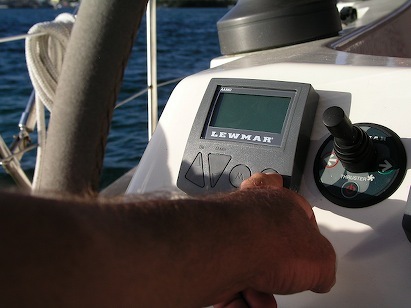 This is a device that counts the chain you have down and displays this at the helm. But it also lets you control the windlass from the helm, so if you want to let more chain out you can do it from the helm. We have seen this used in the Med where you are mooring up against the quay. Drop the anchor say 100 feet away from the dock, then back up while letting the chain out. Tie to the dock and snug up the chain so it keeps you from bumping back on the dock. This is especially easy if you have a chain counter and remote at the helm. Then one person can dock the boat this way! For the installation I had to mount the control at the helm. 3 screw holes plus a hole for the wires. Easy! Next the more difficult bit. 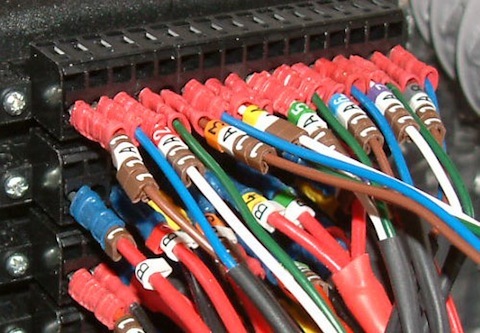 Wiring it in. 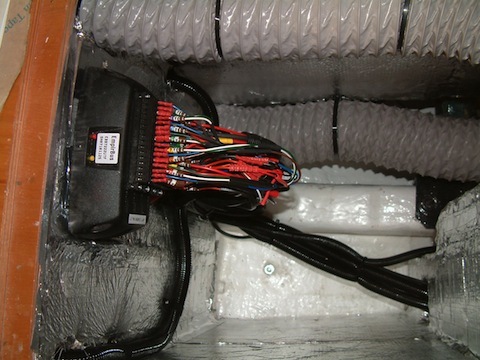 There are sensor wires that run from a magnetic sensor in the windlass to tell the box each time the windlass rotates. This allows it to count the chain. Then there are the control wires to let the device control the solenoid for the windlass. Since we already have a control up at the bow, we will splice into this to have the "AutoAnchor" work in parallel. I put the splice in a waterproof junction box since the locker gets spray in when beating to windward. Now hook up the power and voila! 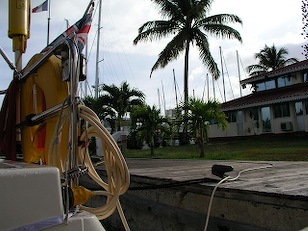 So I clip the wire from the windlass power, rerun power to the forward switch from the AutoAnchor and FINALLY it works. 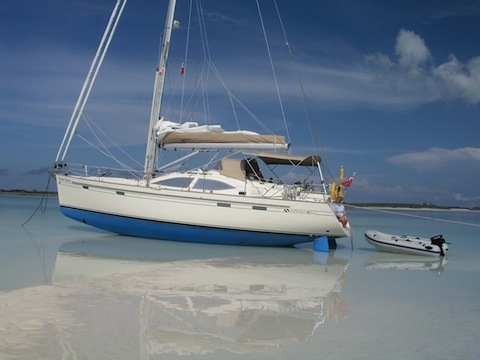 Now I just have to get the anchor up from this sticky mud in the St Martin Lagoon and set sail. This really is the best place to take a break and work on the boat. Chandleries abound, I can get wifi from a completely protected anchorage in the lagoon, and there are French restaurants and pastry shops just a short dinghy ride away. 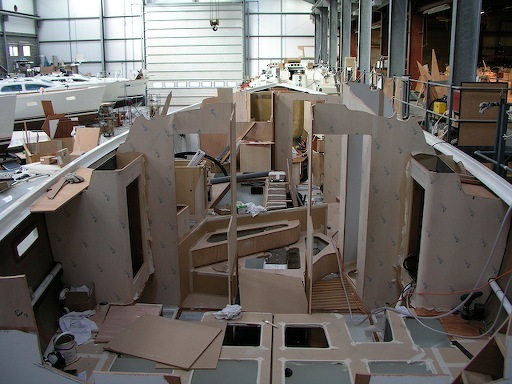 I just got back from a visit to the shipyard in the south of England where Distant Shores was built. 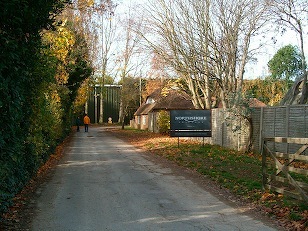 Northshore, who build the Southerly line of swing keel sailboats is located in the very picturesque hamlet of Itchenor, near Chichester and the Solent. I had two reasons to visit. 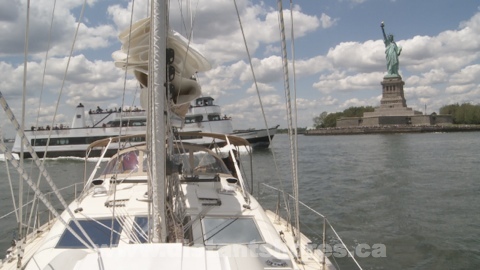 I wanted to catch up with the shipyard and see how they are doing, and secondly we had a couple of charter guests this year who are considering buying a Southerly. They wanted to see the shipyard and check out the other models. 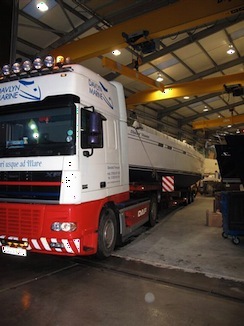 The Southerly line now extends from a 32 footer right up to a 57 currently in build. I was also interested in how the company was doing in the midst of the world news of economic slowdown. On that front I shouldn't have worried. Even the new plant building that wasn't online when we set sail from the dock in November 2007 was mostly full. Business seems to be going quite well. The UK£ is down against the Euro and the US$, so maybe that's partly responsible, making the Southerly more affordable. At any rate it was nice to see such a busy shop. 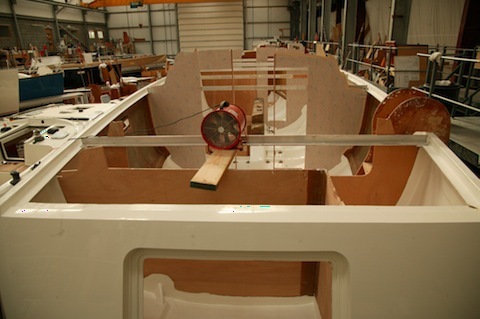 The new 57-footer is well under way - the plug is completed and will be moulded shortly. 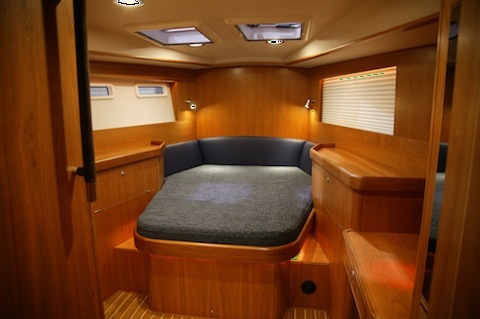 Like all Southerlies, the 57 has a swing-keel and will draw just over 3 feet with the keel up. 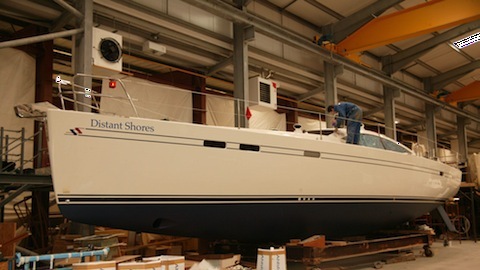 Here is the new Southerly 48 in the shop. The new 48 is much closer to completion. Hull and deck are complete. 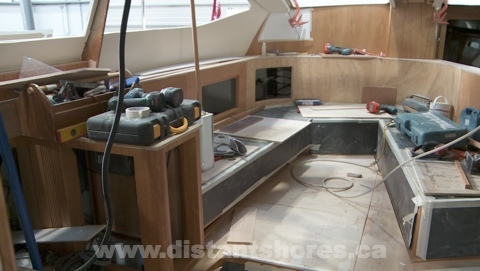 The interior is coming together and plans are to launch her in late spring. She looks like a very fast and spacious boat. In many ways like a bigger faster version of our 42. This is definitely a boat to watch and I will keep up with this model as she gets further along.